10964 continues its series on the smaller enclaves which make up Palisades with this article on Carteret Rd. (Route 340) from Oak Tree Road to the New Jersey border. Carteret Road, also called Route 340, appears on a map for the first time in 1876. The road is shown with one property, the Ellis house, built around 1860, on the west side. 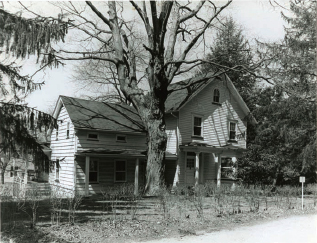 In 1905 Adair Calligan was the proprietor of the Oak Tree Hotel on the corner of Oak Tree Road and Route 340. Both roads were not yet paved in 1913 and the old white oak for which Oak Tree Road was named still stood at the northeast corner of Carteret Road and Oak Tree. The tree was enormous and must have had a spread of nearly 100 feet. By the 1920s, when Carteret Road was the main north/south highway, there were several businesses along the road. Thomas Dillon bred dogs, John Frazebas had a dairy, and Henry Ellis farmed his land. Young Henry Kennell opened a gas station there in the 1920s and another gas station on the road was operated by a man named Gumpert. Bernie Doyle, whose family moved to Carteret Road in 1947, remembers there was only one house — theirs — on the east side of the road between the state line and the Lantern, now Zapata’s. Muroney Avenue was built in the late 1940s as part of a new development called Palisades Manor. In 1958 Nancy and Joseph Shannon who were living in Cresskill bought a lot south of Muroney Avenue. They built their house for $12,000, moving in in December 1960. Nancy’s sister built next door and a cousin lived behind them. They had to build a private road, now Morningside; Park Ave. was already there and Broad was built a year later. At the time the area was heavily wooded and very private; there were only four houses on Muroney Avenue. The children could play safely in the street and in the woods, which extended all the way to the New Jersey border. When they arrived the Shannons had two children. Soon they had five and getting to school became a problem. They weren’t far enough away for busing but walking on Route 340 was not safe because of the lack of sidewalks. Carpools didn’t work because most families only had one car at the time and that went to work with the husband. Nancy and another half-dozen young mothers staged a protest. One morning they blocked Route 340 so cars couldn’t get past. Police Captain Bill Crable came to evaluate the situation, and that afternoon the protestors met with South Orangetown Superintendent Joe Perotta who finally gave them busing. At the time that the Industrial Park in Rockleigh was built in the late 1960s, the residents protested again to preserve R-15 zoning, which a developer wanted to change to Light Industry. Residents wanted to keep a buffer between the industrial park and their residential area and partially succeeded until the residential area expanded. In the 1970s, after a bad accident, residents successfully fought for a light at the Oak Tree Road crossing. During their struggles some had the feeling that their area was on its own, without much support from the rest of the community. Resident Paul Prisco led many battles for the Route 340 area. Gradually the woods filled with houses as the private roads were extended. Drainage became a perennial problem once the sewers were connected. Most of the residents on the side roads have wells because their houses are far from the existing water-line. Smith Court, a cul-de-sac of six houses extending west from Route 340, was built during the 1960s. Sometime in the last 15 to 20 years Yadanza Court was added on the east side near the Mexican restaurant, which was once the Raintree and originally, in the 1960s, the Lantern. Today Nancy Shannon lives in Norwood and her son Michael and his family live in the house on Morningside. When I asked how things had changed since the quiet 1960s, she told me that there are many more people, much more traffic, and a much more diverse population. Dr. Virginia McCauley-Cook, who lives on Muroney, also remembers the past. “When we left our home in Kew Gardens, Queens, that lovely spring morning in 1963, we had no destination in mind. The intent was to have a leisurely Sunday drive, find a pleasant place to have lunch and just enjoy the richness of the day. We took the George Washington Bridge to the Palisades Parkway and aimlessly turned off on exit 4. We traveled on 9W and took the first left turn onto Oak Tree Road — and that is where the magic began. “We drove slowly through a road lined with huge oak trees and there were no cars or people to disturb the splendor of its serenity. There was a primitive beauty and charm about the area that was enhanced by a tiny post office, a lovely little country store, and a quaint library that reminded one of something out of the 19th century. Not far down the road was a building that looked like a one-room schoolhouse. It had about it a whisper of a past generation, but somehow it appeared forlorn and neglected. The houses along the road, though far from new, were well kept and pleasing to the eye. "About a half mile down the road we came to a cross-road. Aside from one house to the right, the rest of the area was heavily wooded. We turned left onto Carteret Road and found two small houses and further on a little country restaurant. We stopped in to have lunch and discovered that it was not a restaurant but a tiny country bar. The proprietor, however, whose name was Stella, was kind enough to offer us homemade sandwiches. Across from Stella’s was a new house that she told us was for sale. After lunch we decided to explore more of the town. We turned south and were amazed to see that it took us over the NY/NJ border. We passed a large school campus called St. Joseph’s School for Boys on the right and down the road on the left was a horse farm. "Wanting to see more of Palisades we turned the car around and headed north. We drove past Oak Tree Road and except for two or three small houses the rest of the area was forest land. We discovered a small road and decided to investigate it. Much to our dismay we found that it led to a lake that was on private property. We were politely told to leave and once more turned our car in the direction of Oak Tree Road. “We could not stop thinking about the house that was for sale in that lovely quiet area of Carteret Road and Muroney Ave. Eventually we returned to Palisades and further investigated the possibility of moving there. We bought the house and by Christmas of 1963 we were settled in. “The hamlet of Palisades as we knew it then has long disappeared. Gone is the tranquility, the quiet that had so influenced us to sell our house in the city and relocate to the 'country.' Where once there had been heavily wooded areas there are now well kept lawns and respectable homes. The house that stands on the south west corner of Muroney Ave. was originally a one bedroom cottage with a pretty garden and colorful fruit trees. When it was sold the new owners expanded the attic to allow for additional bedrooms. After a few years they bought a larger home outside of the County and decided to use their Palisades home as a rental. All of the tenants have been very good neighbors and have adequately maintained the property. On the corner of Oak Tree Road and Route 340 a whole community of houses replaced the once lovely forest land. The many acres that had been the St. Joseph Home for Boys was bought by Bergen County and now houses several county facilities. Except for a Jewish Home the adjacent property has become a huge industrial park. "Carteret Road has earned the name of State Highway Route 340. The road is heavily trafficked and huge trucks thunder by at frequent intervals. What once we had mistaken for a tiny country restaurant has changed hands several times. It is now a Mexican restaurant with bold lights which are on all night long. "Muroney Ave. was not exempt from the hands of time. We now have street lights, one on Morningside Ave. and one on Route 340 that shines right into my bedroom window. There was property behind our house that I tried to purchase, but I was told it was not for sale. However soon after my request, a house was built there. I felt as if it were in my back yard. The DeMaio house was across the street and was one of the original houses. When Mr. DeMaio died the property was sold and the house was taken down and a lovely new house was built. "Although we become nostalgic for the past, if we did not have change we would become stagnant. Our community has profited from the many new people who have come into it and the many beautiful homes they have built. Some of the changes were very beneficial. The little road of long ago that led to a private lake is now IBM. Their grounds are well kept and they have educational programs that aid the community. The fact that they help to lower our taxes to a degree does not hurt either.